Oh Native Foods, How do I love thee? Let me count the ways. 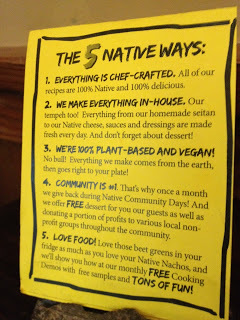 I admit it, I am madly in love with Native Foods Cafe. I had heard about this place when I was living in San Francisco and I could not WAIT to get down to So Cal to try it out. There are a couple of locations near me but my favorite one is in Culver City. They have a great outdoor patio to sit, eat and people watch and they even provide heaters for those rare chilly L.A. days. 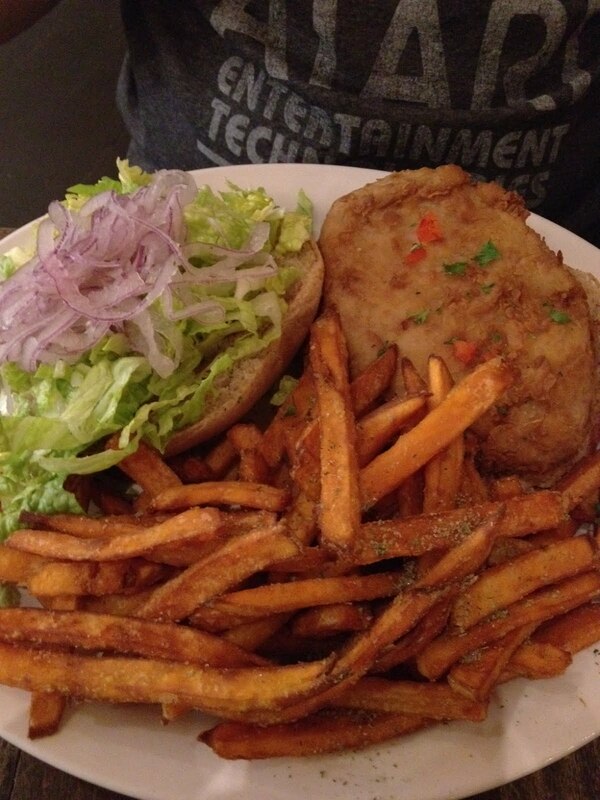 The staff is always friendly and the food is beyond delish. NF is even approved by my omnivore husband and we go at least a few times a month. 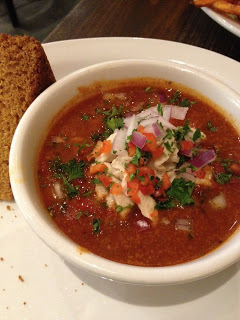 I’ve tried numerous items on their menu including soups, sandwiches, burgers, chili, earth bowls and more. All of it is amazingly tasty and completely vegan. For some reason their Twister Wrap has become my go-to item along with a cup of chili. 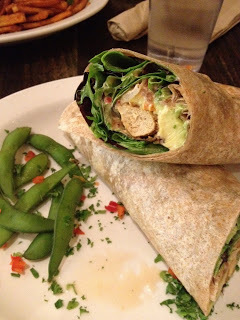 The wrap consists of salad greens, fresh avocado and cucumber salsa, creamy chipotle sauce and your choice of crispy, blackened or grilled Native Chicken (I always go for crispy) all rolled up into a whole wheat tortilla. The flavors are cool, clean and refreshing. The chili is its own kind of amazing as well. It’s hearty with just the right amount of spice and the accompanying corn bread is to die for. It comes with a huge dollop of NF’s own vegan cheese which provides the perfect creamy contrast. 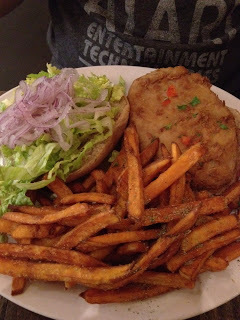 My husband always gets the Portobello and Sausage Burger, which I have yet to try, but on this occasion he got crazy and went with the Chicken Run Ranch Burger (sans ranch) with a side of sweet potato fries. As you can see the portions are HUGE, so it’s basically impossible to walk out of there not feeling stuffed to the gills. If you managed to save room, try one of their many desserts (the cupcakes are my favorite). Also, their Native Ice Tea is a must. Made with organic hibiscus, wild berries and sweetened with organic agave, it’s like a party in your mouth. 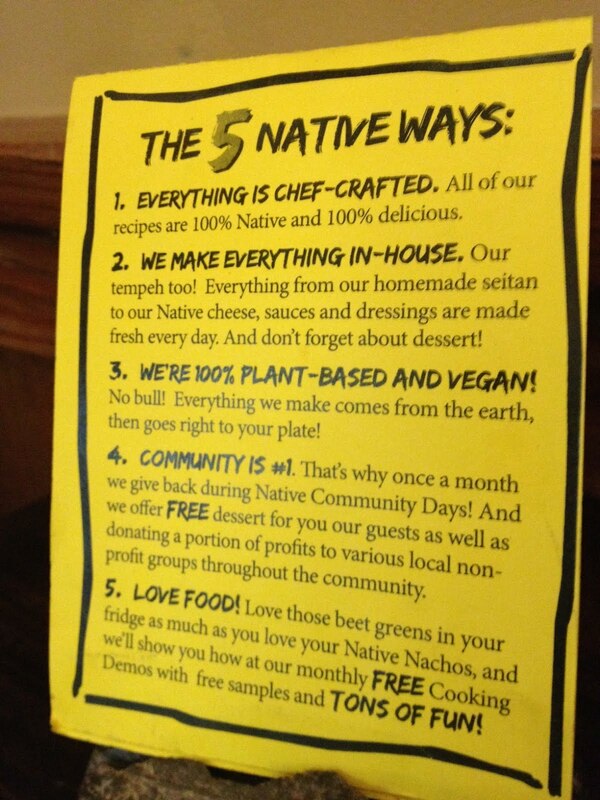 So if you haven’t been yet….RUN RUN RUN to Native Foods Cafe! NOW!